I began researching the Second World War in South East Asia and the Thai-Burma railway well before I had the idea of writing a trilogy about it. The stories grew organically out of the research I did into my father’s wartime experience. He died in 1970 when I was seven, weakened by his three and a half years as a prisoner of war of the Japanese. I began to get interested in finding out about what he had suffered when I was in my early twenties. I suppose it started out as a way of forging some sort of link with him, and also as a way of understanding why he’d died relatively young. It wasn’t until 2010, after many trips to South East Asia, and years of frustrating research, that through help from the Far East Prisoners of War community, I discovered my father’s liberation questionnaire and Japanese record card in the UK National Archives in London. In the questionnaire, he had listed all the camps he had been in on the Thai-Burma railway, together with specific dates. He had also written about some of the things that had happened to him and events he had witnessed. He wrote about an escape attempt by prisoners in one of the camps, and of surviving the torpedoing of a Japanese transport off the Philippines when being transported from Singapore to Taiwan in 1944. The events he had described formed the basis of a plotline for the story of a fictional prisoner, Tom Ellis. He became my central character in Bamboo Heart, which incidentally started life called The Pomelo Tree. At that stage I only set out to write one book. In researching it I read a great deal about the Malaya Campaign and the fall of Singapore. I also researched the plight of prisoners of war and that of the civilian population of Malaya and Singapore caught up in the occupation. I’d read so many poignant stories of personal tragedy, brutality and survival that after I’d finished Bamboo Heart I knew I hadn’t finished writing about the Second World War in South East Asia. I wanted to explore it further through other characters and from different angles. It was only then that I decided to write two further books, and realised that their titles could be linked by the word bamboo. My trilogy isn’t about one set of characters whose stories unfold over three books, as for example in Olivia Manning’s wartime novels forming her two trilogies, the Balkan Trilogy, and the Levant Trilogy. I wouldn’t have been able to explore different experiences in the same way if I’d tried to do that. Instead I wrote different stories linked by one momentous historical event, and by the common themes of war, survival, love, and loss. I was inspired by the fact that each of the books in Sebastian Faulks’ French Trilogy, was a standalone story about war-torn France. Bamboo Heart was already a complete story in itself, but I worked some the events in that book into the two other books in order to link them further. I also gave one or two of the characters from Bamboo Heart cameo parts in the later books. The main inspiration for Bamboo Island was the sinking of the civilian ship, the Vyner Brooke, off Banka Island in Indonesia, and the moving story of Vivian Bullwinkel, the only survivor of a group of Australian nurses who were massacred on the beach by Japanese soldiers. That formed the starting point for my story about a British rubber planter’s wife, caught up in the Fall of Singapore. Real life Bangka Island off Sumatra became my fictional Bamboo Island. 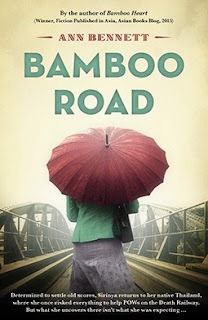 The idea for Bamboo Road took root when I read about the Thai Underground movement, the V Organisation, local people who took great personal risks to help allied prisoners of war. In particular, Boon Pong, a Kanchanaburi vegetable merchant who had contracts to supply prison camps and who smuggled medicines and radio parts into the camps under the noses of the Japanese guards. Details: The Bamboo Trilogy is published in paperback by Monsoon Books, priced in local currencies.